Back then, China wasn't the nation as we know it today. Instead, it was split between 7 major powers, that were constantly at war against each other. They would later be united by Emperor Shihuangti of the Qin dynasty, the same guy who was famous for the construction of the Great Wall. Around the year of 496 B.C., the king of the Wu nation (Hé Lǘ) attacked the nation of Yue, but was defeated by them. The king of Wu died of major injuries, and his son Fu Chai decided to avenge his father's death. Two years later, Fu Chai launched an attack on the Yue nation. The king of Yue, Gou Jian, was surrounded by the enemy forces and under the advice of his loyal advisor Fan Li, he surrendered himself and his wife to Fu Chai. Fu Chai enslaved the couple and Fan Li, giving them a shabby hut near a grave to live in. For three years, Gou Jian and his wife did menial work and helped Fu Chai to take care of his horses. They dressed in rags and obeyed Fu Chai without question. Fu Chai witnessed this and believed that they had no intention to rebel any more. He decided to set them free, despite the advice of his advisor. Gou Jian, upon returning to his native land, swore that he would never forget the shame and humiliation he had suffered in the past three years. He worked very hard to strengthen his country. As he feared that he might be accustomed to a life of luxury and forget his mission, he discarded his comfortable mats and slept on a bed of firewood instead. He hung a small slice of bitter bile above him, and tasted it now and then to remind himself of the suffering he had experienced. This later became a Chinese four-word idiom "Wuo Xin Chang Dan". (Reclining on firewood and tasting bile). It reflected his bitter determination to fulfil his plan of defeating the Wu nation. But how does it relate to our main character, Xi Shi here? Well, Gou Jian wasn't going to burst into the Wu nation and risk another defeat and capture. He and Fan Li came up with a plan to weaken the might of the Wu nation before raging war. The King of Wu, Fu Chai had a weakness for beautiful women. Gou Jian decided to send a few beautiful women to entice Fu Chai. Fan Li found the perfect candidate in the most unexpected place--at a remote village known as ‘Zhu Luo village'. And the lady concerned was a washer-girl by the banks of the Huan Sha river. Xi Shi's actual name is 'Shi Yiguang'. Her surname is actually 'Shi', not 'Xi'，‘Xi' meaning 'west' in mandarin. As her village was located in the western part, and her fellow villagers mostly carried the surname of Shi, later people referred her as 'Xi Shi'. Her father was a firewood seller and her mother a washerwoman (literally from Mandarin, 'a gauze-washing lady'). Xishi often washed gauze too, by the river now known as Huan Sha river. An interesting story prevails to this day. It is said that Xi Shi had a rather weak constitution, and often suffered from chest pains. People sometimes found her clutching her chest with one hand, her brows furrowed. However, they still found her pretty charming. A girl from a village in the East, known otherwise as 'Dong Shi' ('Dong' meaning east) tried to imitate her too. But Dong Shi was ugly by nature. And when she imitated Xishi, everyone was scared by her looks and ran away or shut their doors! A Chinese idiom 'Dong Shi Xiao Pin' refers to this story, about how copying someone else wholly ends up with opposite effects. Xishi had already enough natural beauty to charm anyone. What she lack were dancing skills and culture. 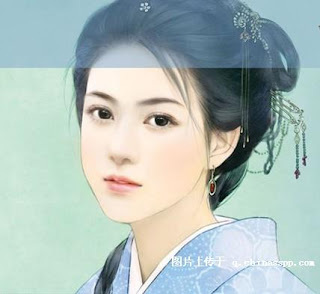 She spend three years in the palace of Yue, rigorously learning skills that she could use to charm the king of Wu. She was also drilled about her mission to her country. Xi Shi did not disappoint and she emerged, well-prepared to shoulder her mission. Along with a couple of other beauties, including one whose name was Zheng Dan, Xi Shi was sent to the Wu nation as a tribute. The king of Wu, Fu Chai was extremely pleased. However his wise advisor Wu Zixi wasn't and saw through the ploy. He tried to alert the king. The king was too smitten to think rationally. He ordered Wu Zixi to be killed instead. Xi Shi managed to capture the king's heart and lured him away from his state affairs. The king, eager to please her, commissioned the building of a palace and a large lake, where green dragon boats could be rowed. He and Xi Shi enjoyed themselves rowing on the lake. He also built palaces to showcase performances, dances and plays, and for feasts and banquets. Xi Shi was skilled at dancing with clogs. The king specially built a corridor using hundreds of large vats, with wooden planks laid on top. For this dance, Xi Shi wore little bells fastened to her dress. The sound of clogs clicking on the tanks, resounding with the clear chiming of the bells, was more than enough to send the king into a drunken stupor. The days passed in this manner. As expected, the power of the once mighty country weakened, and finally the time had come. The king of Yue raised an army and launched an attack on the Wu nation. The king of Wu was powerless to defend his own country. In the end, he realised that he had been wrong all the while--for not listening to the advice of his advisor Wu Zixi. With shame, he committed suicide by cutting his throat with his sword. So now, the nation of Yue had triumphed, and no doubt Fan Li and Xi Shi would be rewarded greatly for their service to the country. Things weren't as simple as that. We shall read on and see. Well, Fan Li was very smart--he knew that the king of Yue was that kind of friend who would make full use of you when he needed you, and once he got what he wanted, he will turn around and stab you in the back. In other words, now the king of Yue has sampled his greatest victory and he no longer required Fan Li's service. In fact, Fan Li could pose a threat to him, with his skills and brains and capabilities. Realising that the king was one to 'keep his bow after the birds are shot, and kill the dogs after the rabbit is caught', he resigned and left the country, and became a successful business man elsewhere. Great retirement plans, I'd say. So what about Xi Shi? It is really disappointing to say this, but no one knows what happened to her for sure. There are several possibilities out there, and I've selected the three most famous ones. #1: Xi Shi had fallen deeply in love with Fan Li during her training sessions, and she ran away with him after her mission was done. This ending is for those who believe in happily ever after. #2: Xi Shi had fallen in love with the king of Wu, and when he committed suicide, Xi Shi killed herself by throwing herself onto a rock beside him. This ending is for those who like the Romeo and Juliet sort of star-crossed lovers. #3: Xi Shi returned to her native land, but the wife of the Yue king feared that she might use her charms and seduce the king and bring upon the downfall of her own country. So, the wife ordered people to sink her into the lake. This ending is for those who don't like happily ever after nor Romeo and Juliet. She is often depicted in Chinese paintings as a beautiful lady kneeling by the riverside, washing gauze. It is said that fishes, dazzled by her beauty, would forget how to swim and sink into the lake, thus winning her the title of 'the one who sinks the fishes'. When I visited China a few years back, the tourist guide showed us some pictures of Xi Shi, where she was painted showing only her side profile or back. He explained that Xi Shi was considered so beautiful that no one could capture her likeness accurately. Whatever her fate was, Xi Shi continues to bedazzle future generations by her legendary charms, her unusual identity, and her mysterious disappearance after her work was done. Haha just some extra interesting fact: in the area where the two nations stood they have found the swords of both the king of Yue and king of Wu (who in fact has 6 of those surviving till now, though they suspect there should be more、inscripted with the words 吴王光） . Not just any king, but of Fu Chai and Gou Jian. Amelia: Thank you! Will be writing one on the Four Famous Ugly Women of China some time in the near future. awesome story. But I've read somewhere that Xi Shi was just a made up female in the history..?.. Yah! you're absolutely right! Xishi was merely figure fictitious, she's not existent. Her appearance was a way to blame for Fu Chai's lost country in ancient Chinese history. It's a pleasure to revisit this blog after so long and discover so many comments, some as recent as 2017. Well, while no record of Xi Shi can be found in the mainstream Chinese history books, such as "Zuo Zhuan" and "Shi Ji" (Records of the Grand Historian), Xi Shi and her beauty is mentioned in a couple of sources, such as Zhuangzi, Han Feizi, Guanzi and Mozi. The only information we can glean from these books is that there was a beautiful woman known to the world as Xishi, OR, Xishi is simply a name given to beautiful women. It was much later when folklore began to weave the threads of a story together, fleshing out the whole Xishi-King Wu-Fanli saga. could you tell me if i could find a ancient story or poems in english?